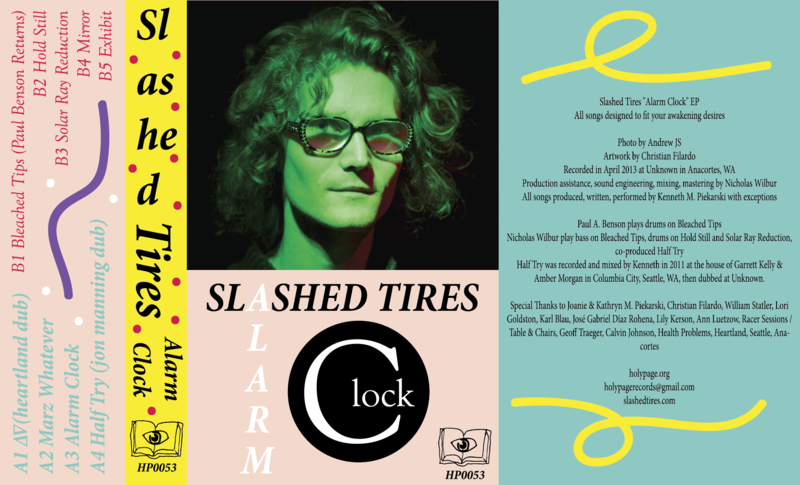 Seattle's own Kenneth Piekarski bka Slashed Tires has released a new EP called Alarm Clock and it is an experimental stunner. If you're into thumping and bumping, unpredictable beeps, the occasional whirling trumpet, and some spoken word-ish vocals, then this is the EP for you. There are some bass lines and freak jams on here that are so preciously unpredictable that they feel as organic as a live performance. Alarm Clock is a masterful look at the changes and spectrums one can aspire to in freeform music creation and it's wonderful. The whole EP is available to stream below, and a casette is being sold through Holy Page here.